The answer is no, according to Gary Gereffi, director of the Duke GVC Center. “National economies can’t be self-contained industries. They have to tie in to other parts of the world. We can re-think relationships, but we need to find a partnership model,” he said. Gereffi articulated this point of view during an April 5th event organized by the Duke International Association entitled US Election, Brexit & Globalization. Giovanni Zanalda, Director of the Duke University Center for International and Global Studies, and Alexander Rosenberg, Duke Professor of Philosophy, joined Gereffi for the panel discussion. Gereffi provided context on three different waves of globalization that have set the stage for the current rise of economic nationalism. · 1945–1990: Following World War II, the Bretton Woods Conference led to the creation of the International Monetary Fund, the World Bank and other institutions to promote stability of exchange rates and financial flows in the aftermath of the war. This was key to reconstruction and a means for the West to contain communism in the Soviet Union and China. · 1990–2008: This intense period of globalization was triggered by the fall of the Berlin Wall, the subsequent collapse of the Soviet Union and economic liberalization in China and India. This ushered in the Washington Consensus, which emphasized the opening of developing countries to global markets. As the name implies, this was led by the United States. This period led to the rise of the BRICs: Brazil, Russia, India and China. · 2009 — current: The strong economic growth from the previous period came to a screeching halt with the 2008–2009 global economic recession. Imports and exports slowed while uncertainty about what worked in the past rose in prominence among certain groups. Although the Washington Consensus model was discredited, there was no obvious successor. The current era of globalization has led to an inward turn for many countries, according to Gereffi. If the United States were to become more insular in line with some of Donald Trump’s rhetoric from the 2016 presidential campaign, it would create a leadership vacuum in maintaining established trade agreements (like NAFTA), international alliances (like NATO), and the broad United Nations system that underpins the global economy as we know it. Such a move inward also doesn’t mean more jobs from the US perspective. Raising tariffs on imports could have negative ramifications on the US (as well as the exporting country). Many companies have set up regional and global production networks to make finished products using a large proportion of imported parts. Case in point: a car has about 30,000 distinct parts and an iPhone has hundreds of parts, many of which are not available in the US supply chain. “If you try to raise taxes on all the inputs that are made in different countries, you’re not only affecting the parts producers abroad, but also the final goods producers in the US,” explained Gereffi. This is true for the US automobile industry, where 40 percent of the $20 billion in auto parts imported from Mexico are US-made parts and components. While economic nationalism is not sustainable, Gereffi believes that actions need to be taken to support those who might view themselves as impacted negatively by globalization. In industrialized nations, the most vulnerable groups often are workers whose skills and experience are rendered obsolete by new technology at home or low-cost imports from abroad. As a reference point, Gereffi highlights that 25% of Germany’s workforce is in manufacturing, while in the US it is just 9%. The discrepancy is due to Germany’s emphasis on re-training employees to cutting edge technologies. “For the US to rebuild manufacturing, it requires creative thinking,” he concluded. Direct policy impact: The summit involved people in positions to make policy at top international organizations—such as the World Bank, the IFC, the World Trade Organization, World Economic Forum, Inter-American Development Bank, African Development Bank, OECD, UNCTAD, UNIDO, ITC, and the ILO, among others—all of whom are interested in the policy implications of a world economy increasingly influenced by global and regional value chains. Influence on development discourse among practitioners: Outputs of the summit, including a summit webpage, live video, a mini-documentary, and a series of policy briefs, reached a global audience interested in issues of globalization and development. Academic research on governance and value chains: By interacting with leading practitioners, academic researchers gained a better understanding of the key issues and questions facing policymakers, and helped to disseminate the results of the Global Summit to diverse groups. More information is at the following link. 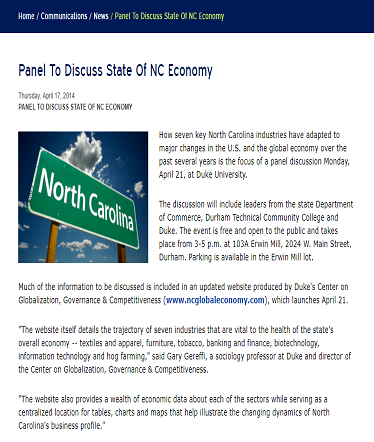 How seven key North Carolina industries have adapted to major changes in the U.S. and the global economy over the past several years was the focus of a panel discussion at Duke University in April 2014. The discussion included leaders from the state Department of Commerce, Durham Technical Community College and Duke. The event was free and open to the public. 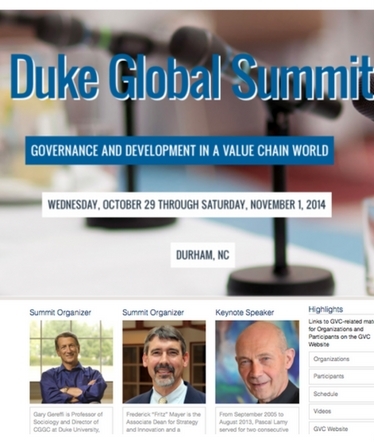 Much of the information discussed is included in an updated website produced by Duke CGGC (www.ncglobaleconomy.com). 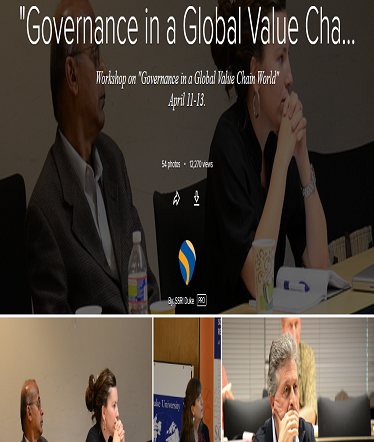 The workshop involves a number of prominent GVC researchers and a variety of other local scholars on the theme of Governance in a Global Value Chain World. The workshop was supported by the Center for International Studies (CIS) at Duke, and was part of the Globalization, Governance and Development (GGD) seminar that Giovanni Zanalda and Gary Gereffi co-organized. 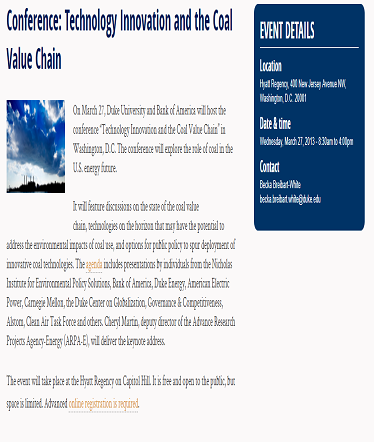 Duke University and Bank of America hosted a conference in 2013 entitled “Technology Innovation and the Coal Value Chain” in Washington, D.C. The conference explored the role of coal in the U.S. energy future. It featured discussions on the state of the coal value chain, technologies on the horizon that may have the potential to address the environmental impacts of coal use, and options for public policy to spur deployment of innovative coal technologies. 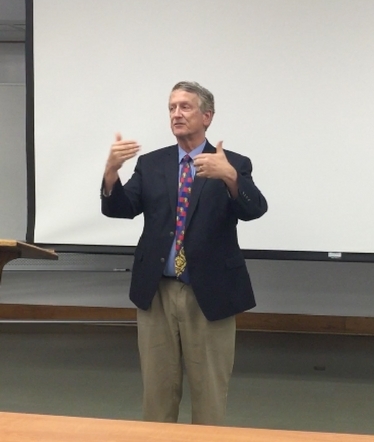 The agenda included presentations by individuals from the Nicholas Institute for Environmental Policy Solutions, the Duke GVC Center, Bank of America, Duke Energy, American Electric Power, Carnegie Mellon, Alstom, Clean Air Task Force and others. The event was free and open to the public. On March 20, 2013, a delegation from Nicaragua led by General Alvaro Baltodano, Presidential Delegate for Investment, Promotion and Foreign Trade, met with Stacey Frederick, Research Scientist, Karina Fernandez-Stark, Senior Research Analyst and Mike Hensen, Assistant Director, to follow up on a 2010 Duke GVC Center research project led by Gary Gereffi on improving the competitiveness of Nicaragua’s textiles and apparel industry. As part of the study, Gereffi and Duke alumnus and University of Colorado faculty member Jennifer Bair led the research team to Nicaragua in the fall of 2010 to interview textile and apparel companies and government officials involved in trade promotion in this sector. The visit to Duke, facilitated by Ambassador Michael Samuels, President of Samuels International Affiliates, who was accompanied by Ms. Kimberly Glas, Deputy Assistant Secretary of Commerce for Textiles and Apparel in the US Department of Commerce, was to discuss future CGGC research targeted at identifying new growth strategies for Nicaragua in textiles, including attracting foreign direct investment, that would increase national employment and improve Nicaragua’s overall global market share in this industry. Duke University and the Environmental Defense Fund (EDF) hosted an interactive workshop, facilitated by Duke faculty and staff with Climate Corps alumni and their host companies, to distill lessons learned from three years of work on ways companies can make their manufacturing and other corporate processes more efficient and reduce carbon emissions. 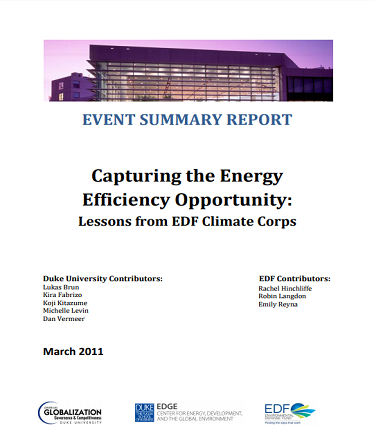 An event summary report, published in March 2011, is provided below, entitled: Capturing the Energy Efficiency Opportunity: Lessons from EDF Climate Corps.